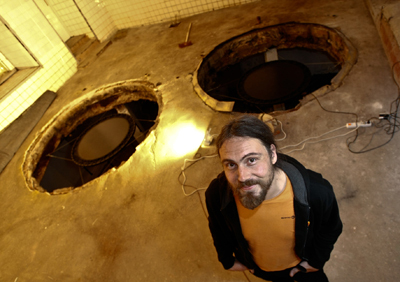 Raul Keller (* 1973) is a sound, video, performance and installation artist, residing in Tallinn, Estonia. He has been performing and exhibiting from 2000, including the Netherlands, France, UK, Poland, Baltic States and Russia. Keller´s recent works are commissioned site-specific sound installations, radioart as improvisation, performance, videoart and location specific group improvisations. The latter started in 2000 as “Project Unison”, an experiment in both architectural sound / sound architecture and sound as a form of social communication, which been released on 5 CDs. Keller also performs as Paul Cole, a fictional rock artist who has released albums in 2004 and 2009. In 2009 his first solo album ‘Me tuleme kaugelt / We Come from Afar’ was released under MKDK Records label. It contains excerpts of commissioned work from 2004-2009.